We've decided to have Bland King Penterest give these guys gifts, so let's see what every other option does! Going directly to the temple has no extra dialog to offer us. 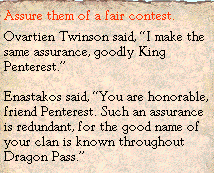 Bland King Penterest assured the other kings of a fair contest, and the other kings responded in kind. Bland King Penterest was possessed by a chaos spirit and stopped being bland for two seconds, which led to his demise. 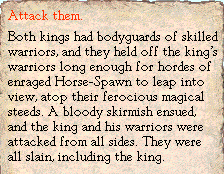 It also led to the demise of every single one of the Bad Luck Clan's weaponthanes, and it also caused the game to forget that we're supposed to be calling the Horse-Spawn "Grazers" now. 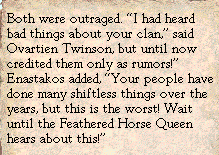 Bland King Penterest taunted the other kings, who mumbled to themselves about how he was acting out of character. 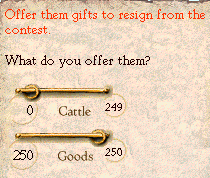 Bland King Penterest gave the other kings gifts but in a "please resign" way, and the other kings were outraged. This did not bring a halt to the contest, however. But he really gave them gifts in a regular way, and all pledged a fair contest. Accompanied by his clan ring, Penterest proceeds to the Hidden Temple of Maran Gor, the goddess of earthquakes and the destroying earth. He requests an audience wiht its high priestess, Ferena Brooslayer. The terrifying earth crone waddles from her high seat and looks Penterest in the eye. "The Horse-Spawn have had a rebellion, and now revere earth above the sun, so I have agreed to act as the gatekeeper of the tests, instead of seeking to destroy them. But how do I know that you are worthy to learn of the tests? Perhaps you are weak or unwise, and would be better of retiring to your tula to herd sheep." -Give up on the quest. -Remind her of your good relations with the Hidden Temple. -Scold her for confusing kings with shepherds. I know I am worthy. How can I convince her of this? Although she is a terrifying goddess, Maran Gor fought chaos with the help of her patron animals, the enormous Earthshakers. The Hidden Temple has reason to respect us; it will not hurt to remind them of this. Although she serves the earth's dark side, she serves the earth nonetheless. Although she will settle for ordinary gifts, and would be pleased by a treasure with an affinity for her temple, she most wants thralls for sacrifice. Eurmal once looked at Maran Gor's secret parts, and his eyes rolled out upon the ground, which swallowed them up. 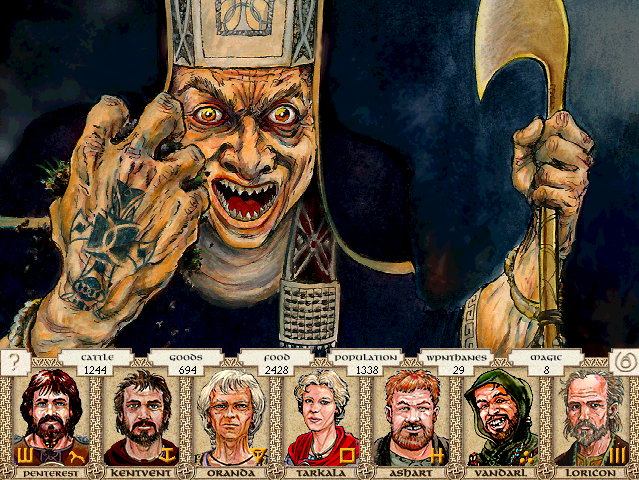 Although Maran Gor is a frightening goddess, she is Ernalda's sister, and is not considered an enemy of our people.